Snow has switched to rain south of Seattle. The warm front is moving north and should reach Seattle on Monday night. Before then, several more inches of snow are expected. 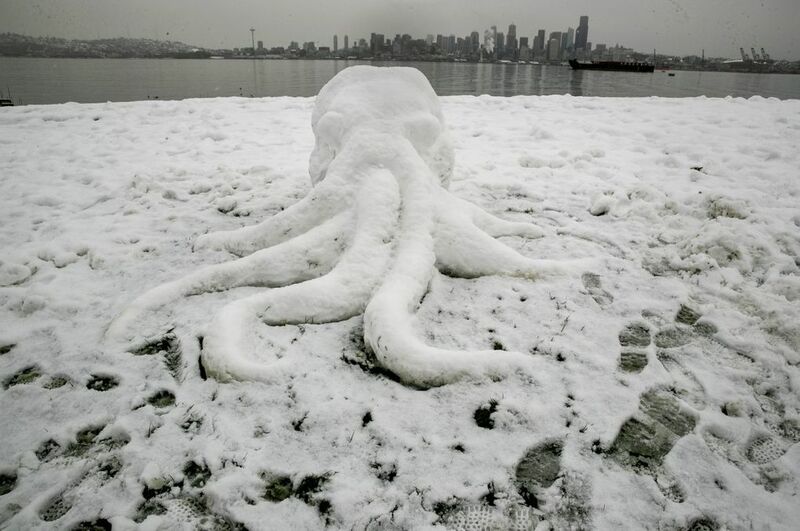 Editor’s note: This is a live account of the Seattle region’s snowy Monday, Feb. 11, as events unfolded. A full recap and outlook for the week is available here. Live updates from Tuesday, Feb. 12, are available here. 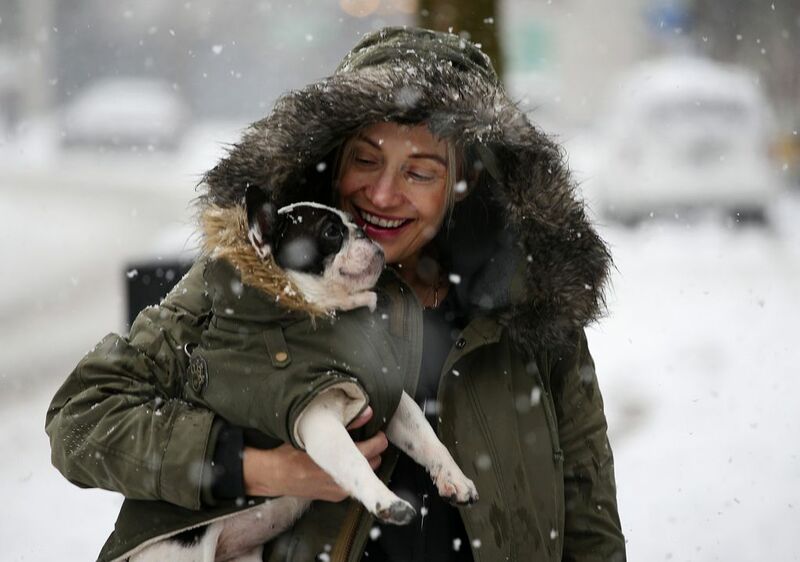 Seattle saw snow flurries Monday morning, but precipitation is forecast to turn into “cold, miserable rain” in the evening, which could cause urban flooding. 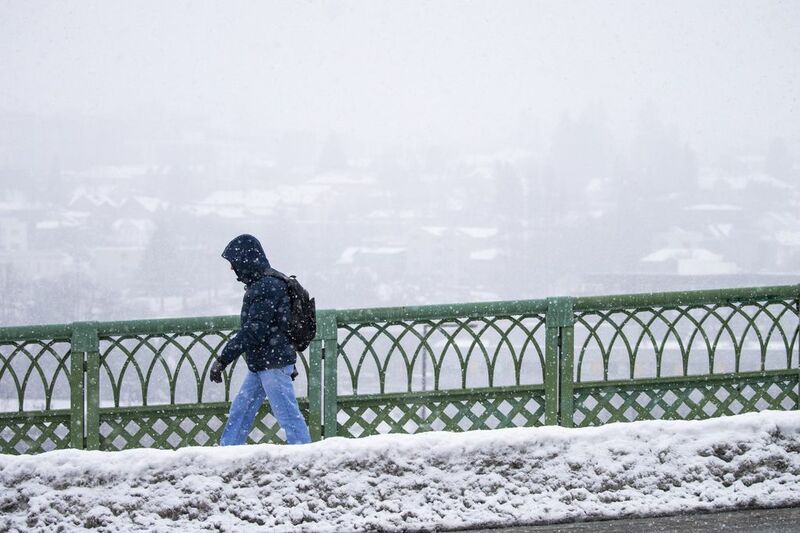 Some school districts around Puget Sound have canceled classes for Tuesday, and public transportation remains limited. Metro will operate only 60 core routes until at least Tuesday night. 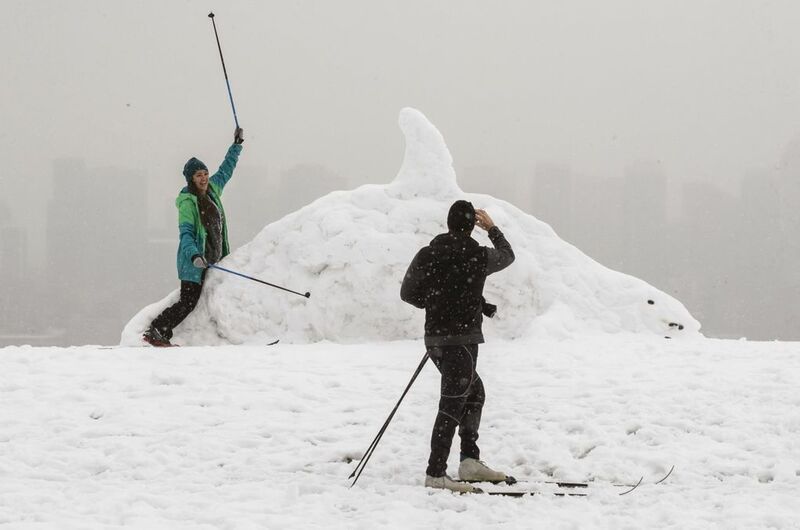 Seattle-Tacoma International Airport has seen more than 19 inches of snow so far, making this the snowiest month in 50 years, according to the National Weather Service. The airport has seen more snowfall during the past week than it typically does in an entire winter. 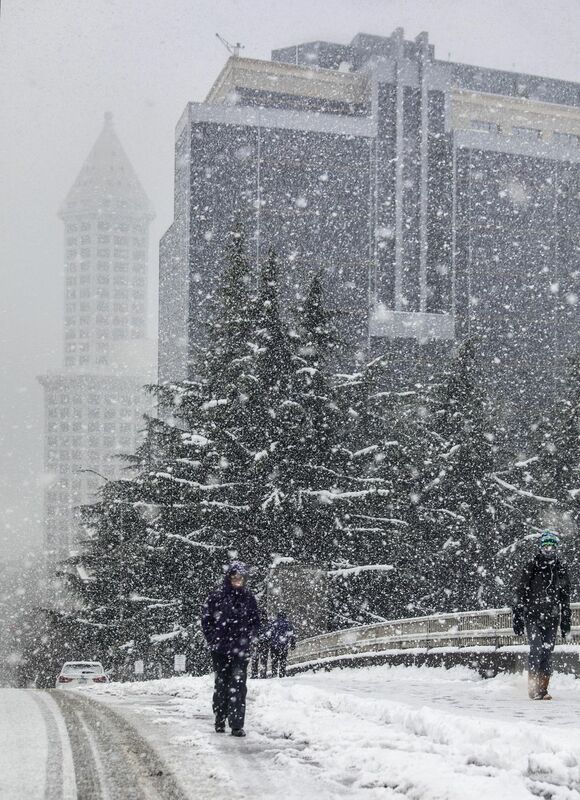 Seattle Public Schools will be closed Tuesday, and district headquarters will have limited services, according to a statement from the district. Preschool classes and Head Start are also canceled. The University of Washington and Seattle Colleges canceled Tuesday classes at all of their campuses. 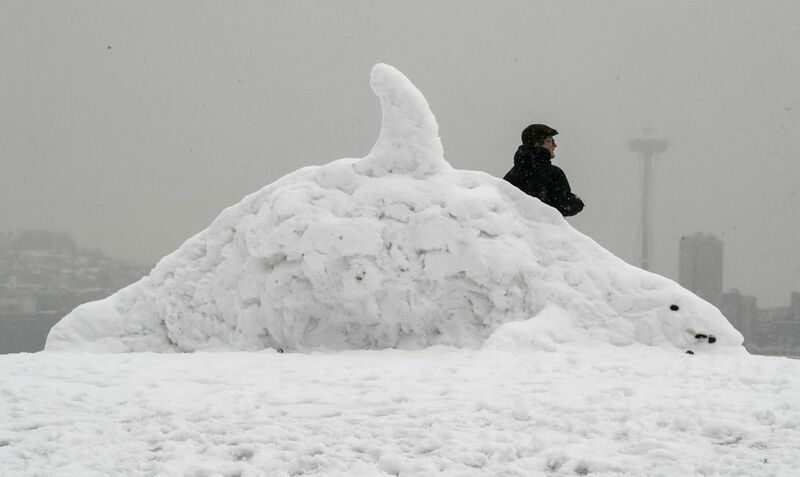 You can find a more complete list of closures, cancellations and delays here. 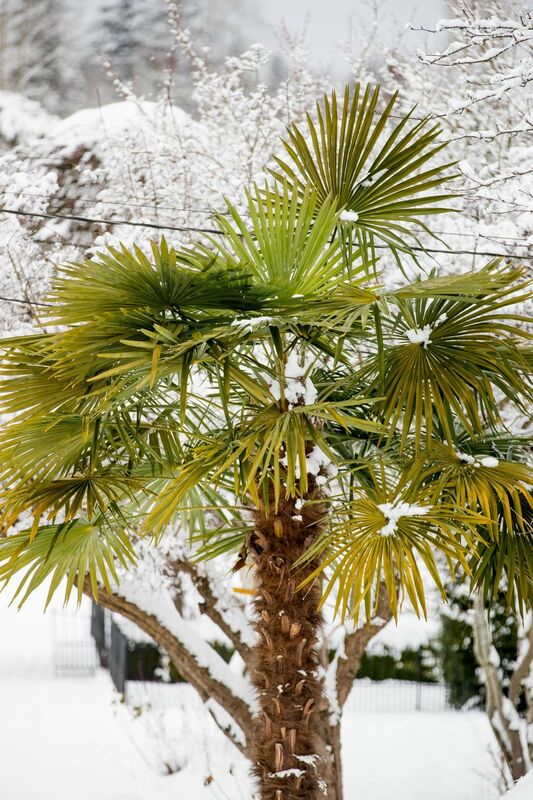 Heavy snow in the region is causing downed trees and power lines, according to the National Weather Service. Nearly 19,000 Seattle City Light customers were out of power at 7 p.m., with outages most heavily concentrated in North Seattle. Around 30,000 Puget Sound Energy customers were out of power, mostly around Bainbridge Island and Olympia. The Seattle Fire Department responded to dozens of downed power lines Monday evening, including some trees that had caught fire as a result, said spokeswoman Kristin Tinsley. There have been no injuries related to downed lines so far, she said. The department is advising people to stay at least 20 feet away from downed lines and report them to Seattle Public Utilities at 206-684-3000. Downed lines that appear to be smoking or sparking can be reported to 911. Generators, grills and gas ovens should not be used for indoor heating, as they can lead to carbon monoxide poisoning. Flights headed to Sea-Tac Airport have been delayed at their origin as the airport deals with full gates. The airport was put under a Federal Aviation Administration “ground stop” before 5 p.m.
Runways at the airport are clear, but airlines have struggled to de-ice and send off aircraft on time, Port of Seattle spokesman Perry Cooper said. The airport had seen 389 canceled and 263 delayed flights as of 6:45 p.m. Monday, according to FlightAware. Travelers should check their flight’s status with their airlines. 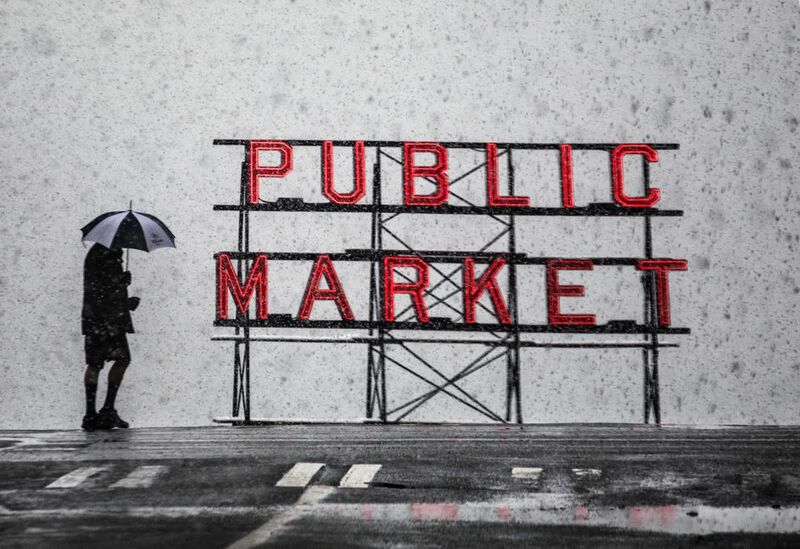 Snow showers have switched to rain in the Puget Sound region south of Seattle. The warm front is moving north and should reach Seattle Monday night, according to the National Weather Service in Seattle. Before then, several more inches of snow are expected. 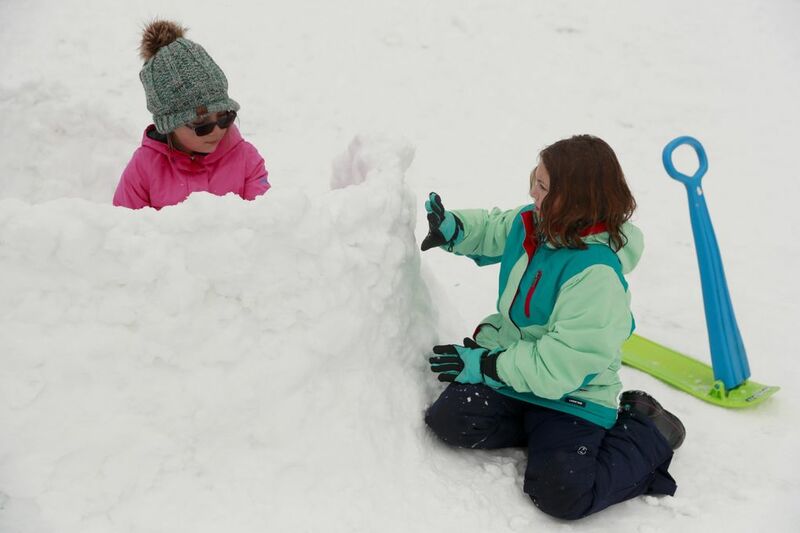 Showers may switch between snow and rain as temperatures warm, but the worst of the snowstorm should soon be over, said meteorologist Logan Johnson. 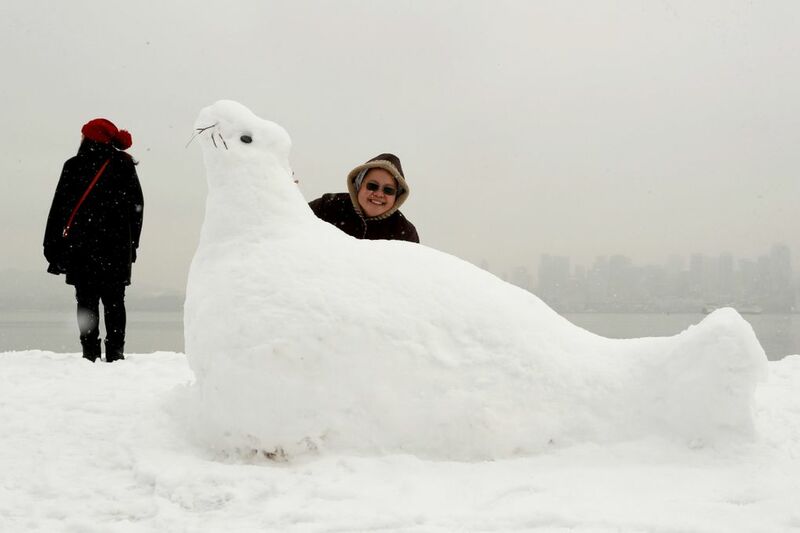 There’s a chance of more snow on Wednesday, but it will be mixed with rain. “It won’t be anything like what we’ve seen the past few days,” Johnson said. The switch from snow to rain will extend only as far north as Everett. Snow showers will continue farther north, according to the National Weather Service. At a news conference Monday morning, Seattle Mayor Jenny Durkan fielded a question about whether there have been any deaths among the homeless population. She mentioned that there was one death from exposure over the weekend, but the circumstances are still being investigated. That’s in addition to the Feb. 7 death of a man who was found facedown on the pavement near the Sodo light-rail station platform. The man, Derek C. Johnson, 59, had no permanent address. Per state law, Election Day can’t be moved or extended, so drop boxes for ballots in Tuesday’s special election will closely promptly at 8 p.m. The Union Station accessible voting center is closed today and will be closed Tuesday, but the King County Elections accessible voting center in Renton is open. In Seattle, voters will determine the fate of two Seattle Public Schools levies that cover the cost of the district’s operations and construction projects. 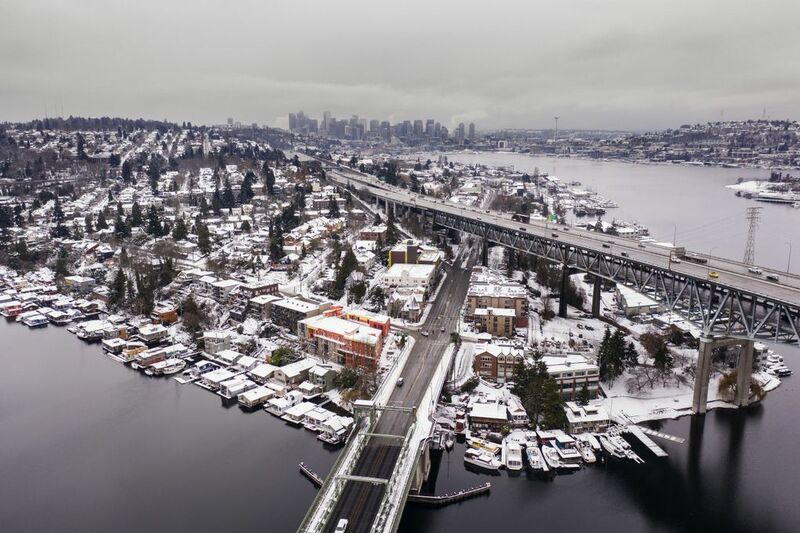 Another band of snow is moving into Seattle and will become heavier over the next hour, the National Weather Service said. About 2,380 Puget Sound Energy customers remain without power after outages earlier this morning. 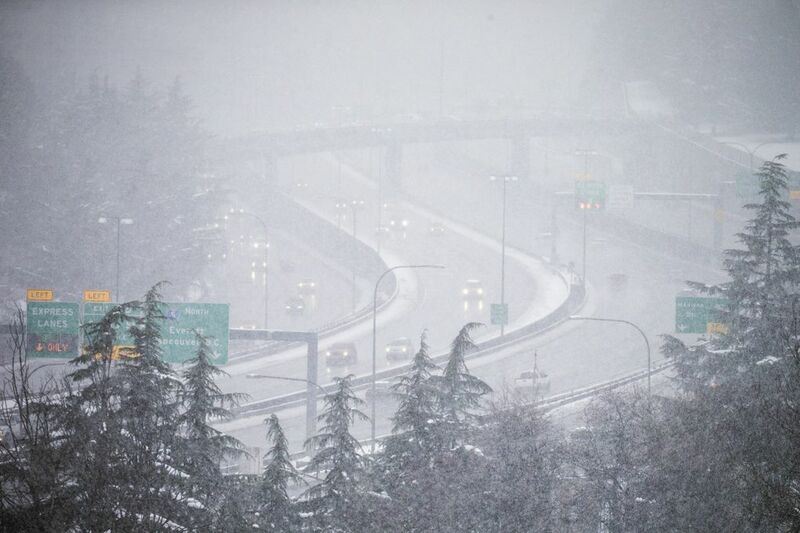 A winter weather advisory has been issued for Seattle, the Eastside and south to Tacoma through 6 p.m. Monday. Up to three inches of snow is expected, with precipitation turning to rain later this afternoon, according to the National Weather Service. Snowfall accumulations may be heavier within the Seattle metro area and extend into the evening. The Justin Timberlake concert at the Tacoma Dome scheduled for this evening has been canceled because of the weather. Both his Monday concert and previously postponed Sunday concert will not be rescheduled. Refunds are available at point of purchase, according to Live Nation. 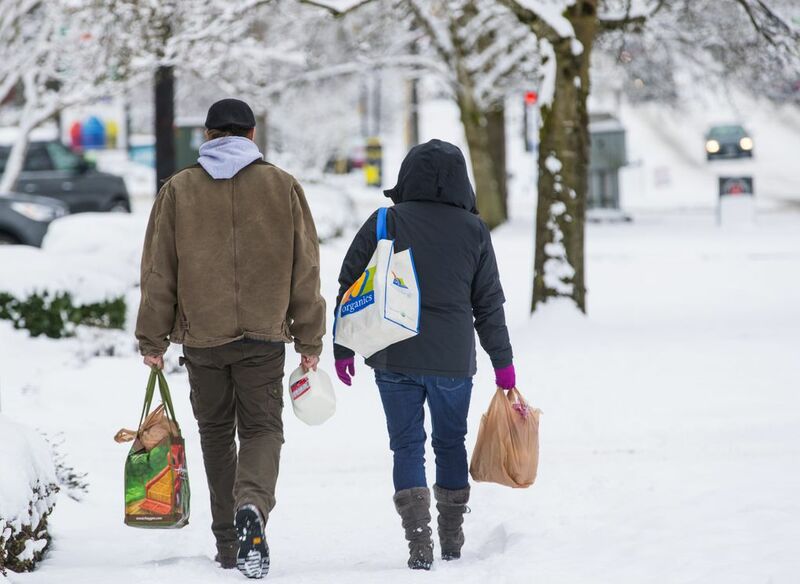 The National Weather Service has issued a winter storm warning for the East Puget Sound lowlands, including Everett, Lynnwood, Marysville, Bonney Lake, Arlington, Granite Falls, Carnation, North Bend and Eatonville. 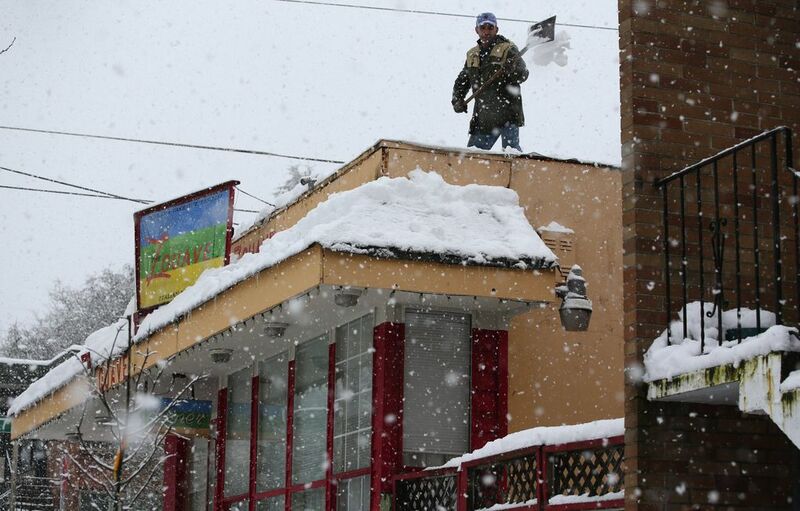 Up to six additional inches of snow are expected through 6 a.m. Tuesday. … don’t do it near a highway. 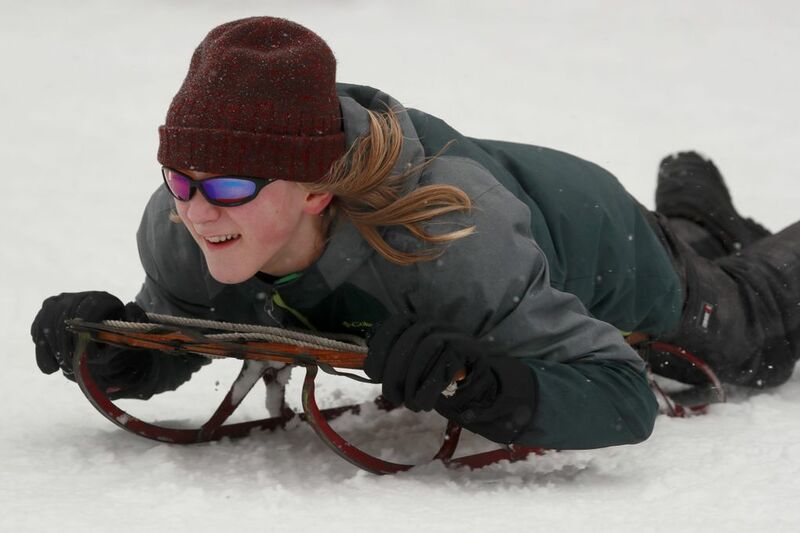 The Washington State Department of Transportation captured a video of sledders dangerously close to Interstate 5 at Northeast 175th Street in Shoreline. 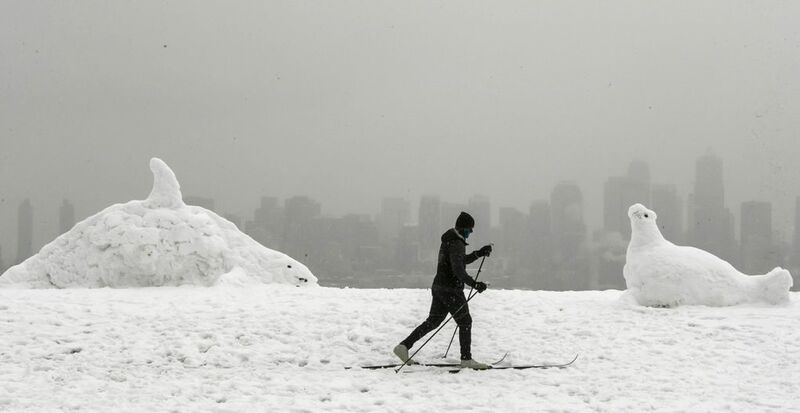 Want to sled or ski? Here’s a guide for fun spots around Seattle. The city’s severe weather shelter at the Seattle Center Exhibition Hall will remain open through Sunday night for people ages 18 and older. A 24-hour shelter at Garfield Community Center will be open through Wednesday morning. 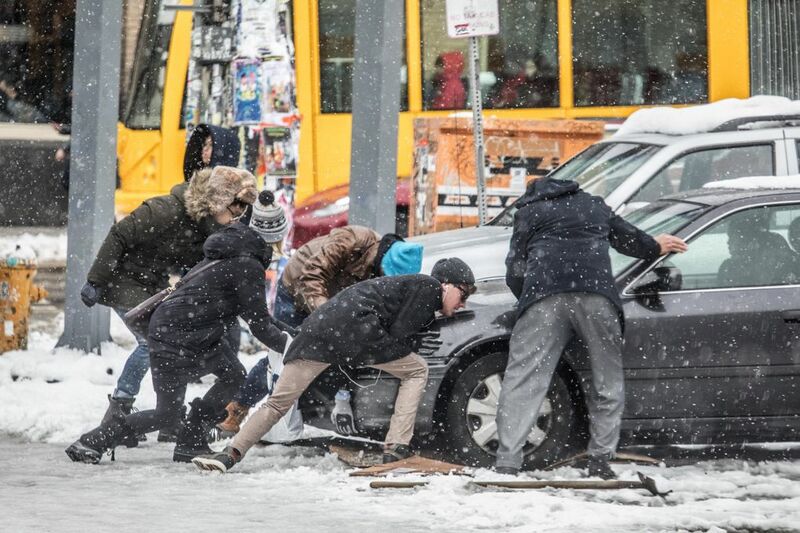 The homeless Navigation Team helped 67 people travel to a shelter on Sunday night and distributed gloves, hats, socks and food to others living unsheltered who didn’t want to come inside. 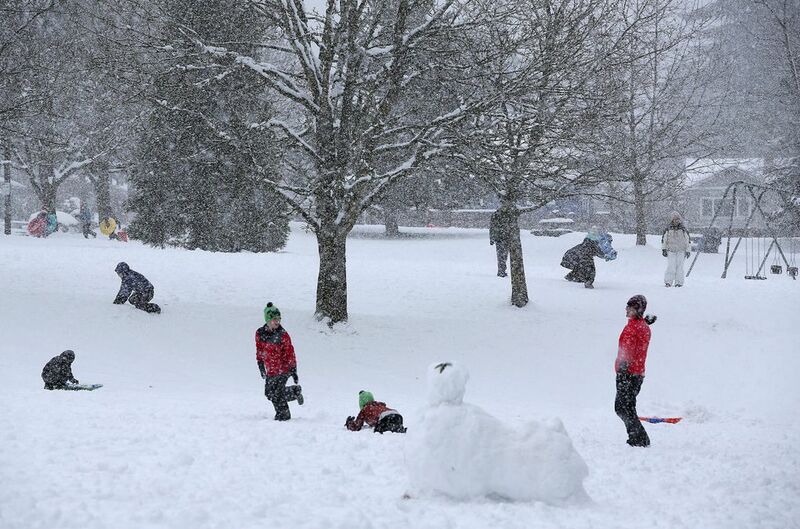 School districts around Puget Sound canceled classes ahead of the arrival of potentially significant snowfall on Monday. The state’s House and Senate canceled all their Monday hearings. 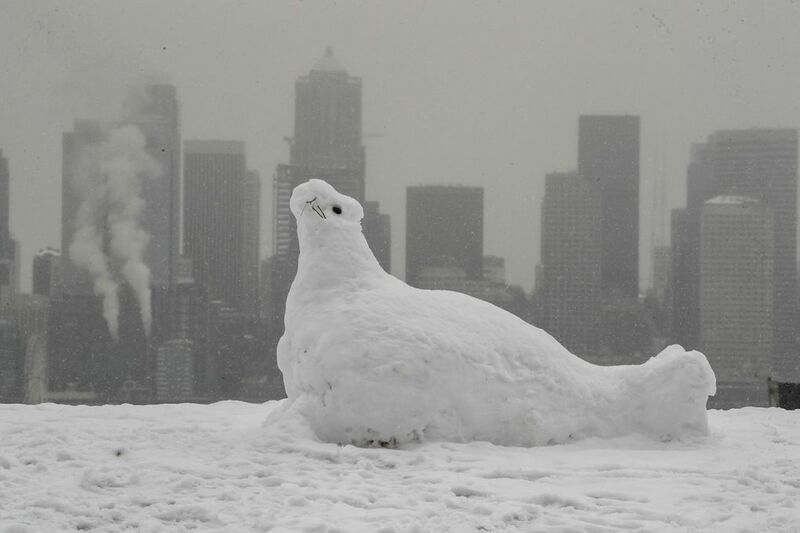 The Museum of Pop Culture, Woodland Park Zoo and King County libraries have all closed for the day. A longer list of the latest events and attractions is available here. The runways and taxiways at Seattle-Tacoma International Airport are clear and open this morning, but many flights are delayed or canceled in anticipation of bad weather this afternoon. There have been 76 delays and 250 cancellations today for flights to and from Sea-Tac, according to FlightAware. Arriving flights are delayed by an average of one hour and 25 minutes. 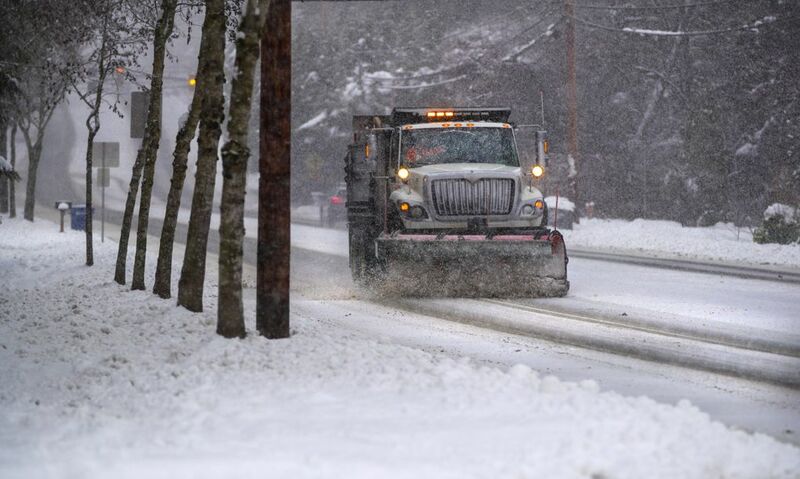 The National Weather Service has issued a winter storm warning for the Cascade mountains and valleys of King and Snohomish counties, including Darrington, Index and Skykomish, and Stevens and Snoqualmie passes. 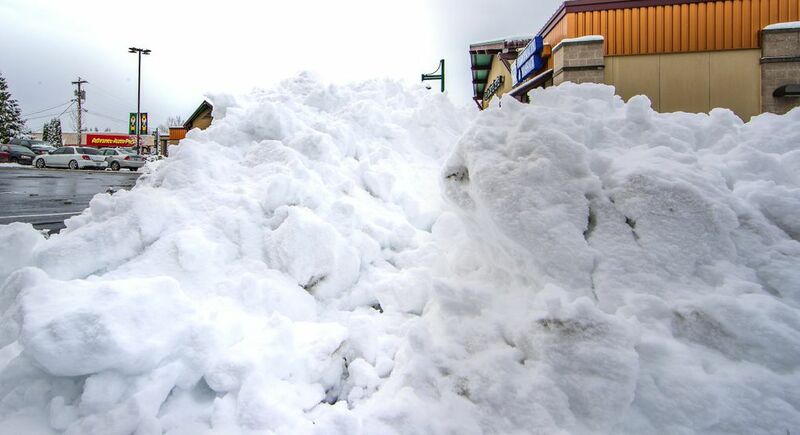 Two to three feet of snow are expected through 6 p.m. Tuesday. Travel may be difficult or impossible, the Weather Service said. Eastbound Interstate 90 at Snoqualmie Pass near Denny Creek will close at 10 a.m. for avalanche control. Chains are required on all vehicles, except vehicles with all-wheel drive, for both directions. Traction tires are required for all vehicles on Highway 2 at Stevens Pass. 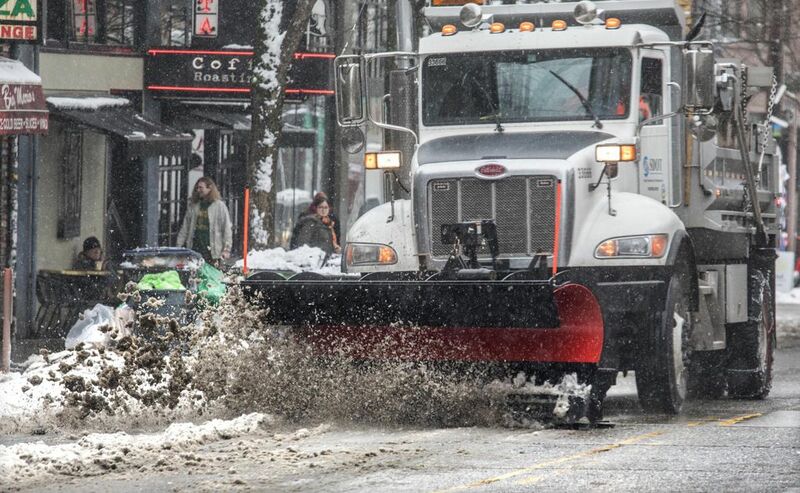 King County Metro is operating its Emergency Snow Network until at least Tuesday night with only 70 routes. 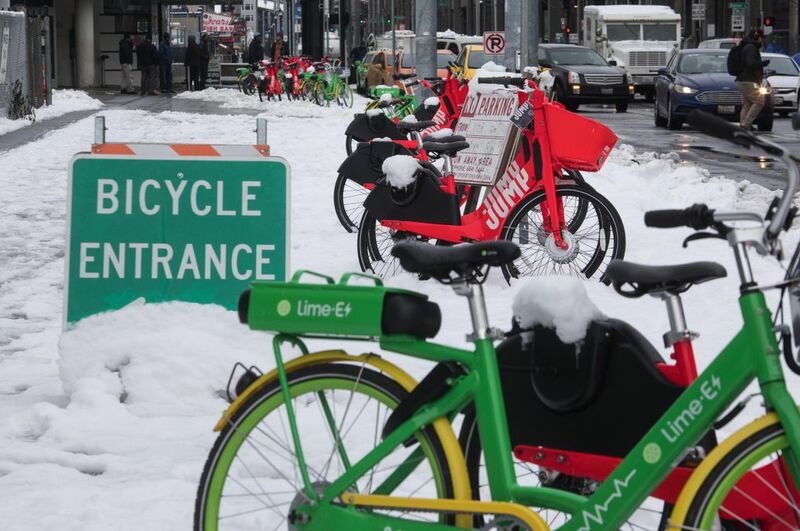 The routes are those with high ridership that run on plowed arterial roadways, but some residents are along routes that can’t be served during winter storms, Metro said. Third-party apps like One Bus Away may not be reliable because they don’t filter out routes that aren’t running, Metro said. Expect delays on Interstate 5 if you’re traveling near Olympia. 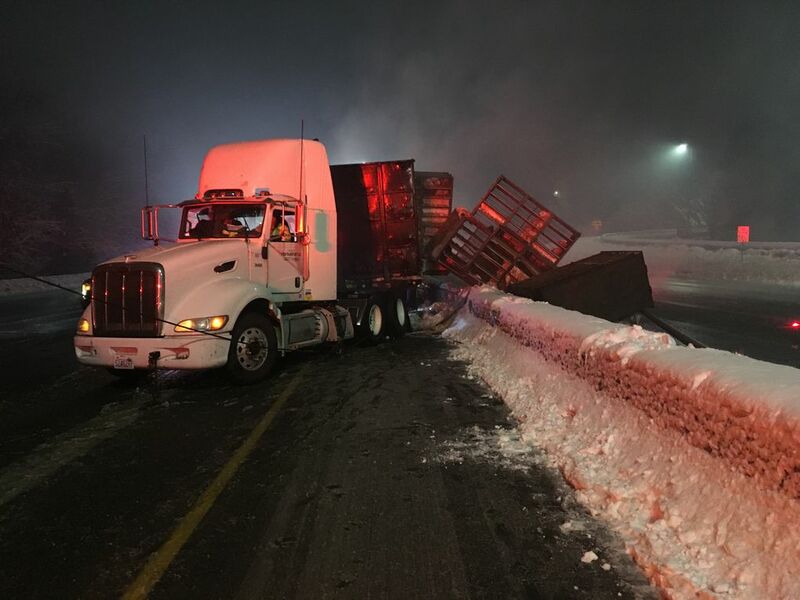 A semitruck accident shut down a portion of the highway around 4 a.m. after the driver lost control and struck the center barrier. 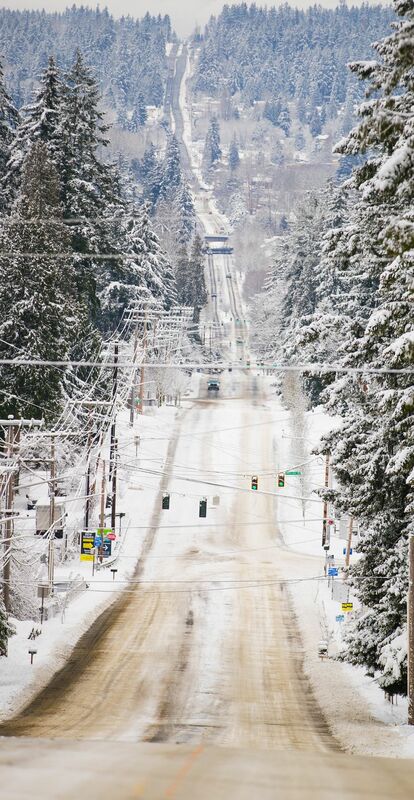 About 2,750 Puget Sound Energy customers are without power Monday morning. Most of the outages are concentrated in Olympia and the South Sound. In Seattle, there will be no garbage, recycling or food/yard waste collection on Monday, according to Seattle Public Utilities. All waste will be picked up on Tuesday, and Monday customers can set out additional bags at no extra charge. 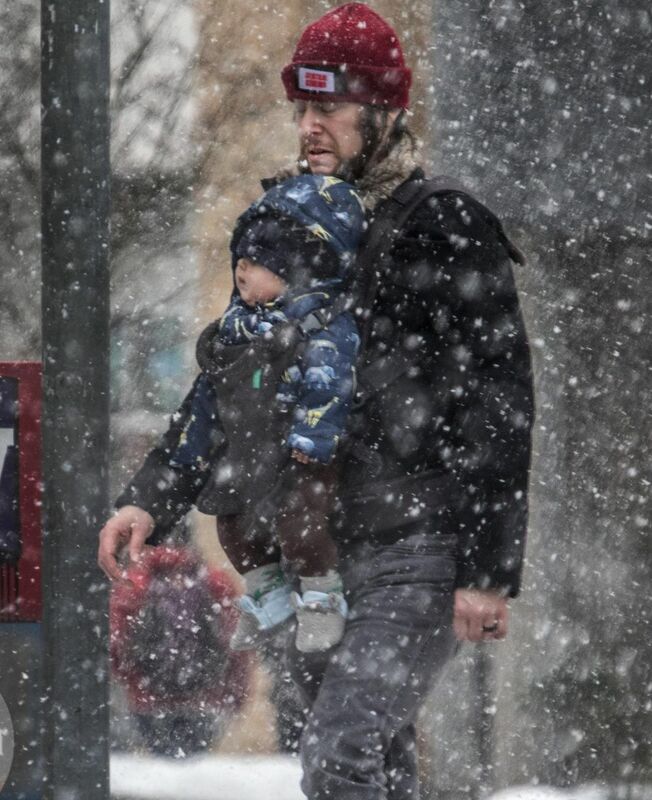 The National Weather Service says today is going to get “complicated.” We’ll post updates about the weather, traffic conditions, closures and more throughout the day. 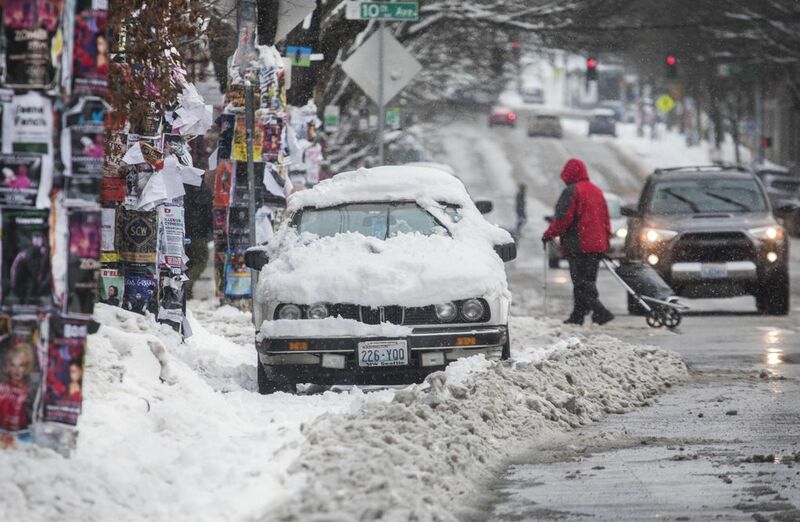 We’ll have snow flurries in the morning, but sometime later the precipitation will turn into “cold miserable rain” which — when poured on inches of snow — could cause urban flooding, according to Dustin Guy, NWS Seattle meteorologist. 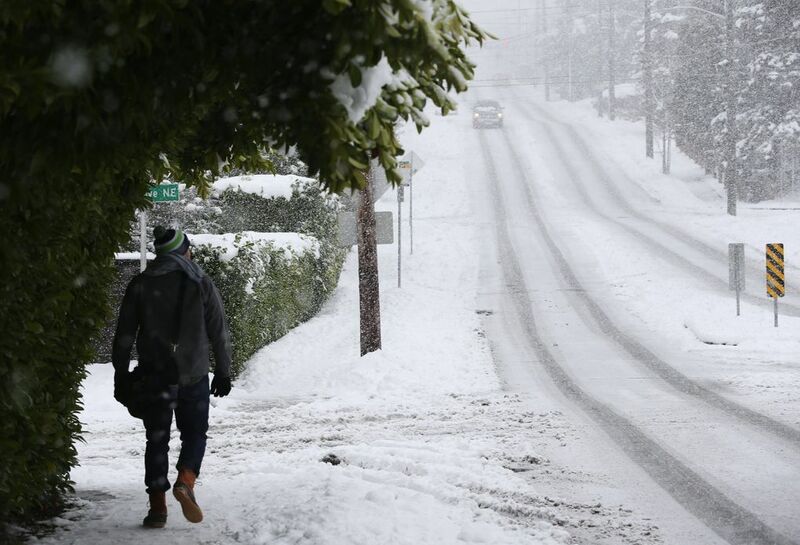 Guy says Seattle and south of Seattle will get that cold rain, while areas north of Everett could see more snow. 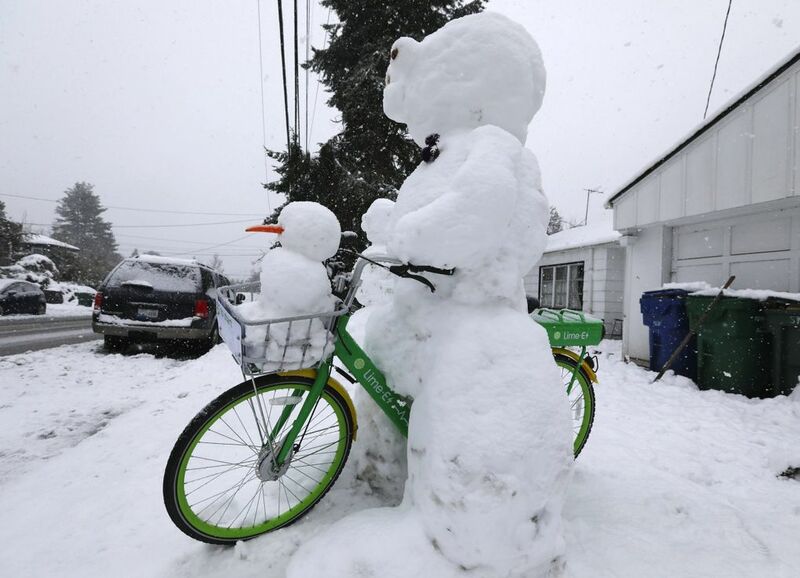 Traveling through the Seattle area will be difficult during Monday morning’s commute. Areas hit with rain could potentially have a worse commute Tuesday because of ice on the roads. King County Metro Transit has reduced its bus network to 60 high-ridership routes. A full list is available here, and a map is available here.